Every year when Valentines rolls around I find myself torn. On the one hand I love the idea of a day that celebrates love. On the other hand I feel increasingly uncomfortable about how consumer driven this event has become. Could we find a different way to share love on Valentine’s Day? Could we model a way of celebrating the day that helps our families offer the gift of love and kindness? Easy for younger children to do. There are no complicated crafts here! Fun for both parenst and kids. I’ve gathered together the very best ideas I could find. Some of these acts of kindness were not specifically for Valentine’s Day, but can easily be adapted. Give the gift of time to new parents by offering to babysit on Valentine’s Day. It can be hard to carve out time together when you have a newborn and babysitting can be expensive. Invite your children to come with you. Our boys always enjoyed helping to look after young children. The emphasis on material expressions of love tends to bring a lot of waste with it. Show some kindness for the environment by carefully considering how you might celebrate a waste free Valentine Day. Could you celebrate by spending time together doing something fun, or make gifts that use recycled materials? I have gathered together a number of eco-friendly Valentine’s Day over at Pinterest to help provide some inspiration . Two of my favorite ideas are this adorable Valentine garland made from an old map and these cute recycled crayon hearts . A big part of Valentine’s Day is candy. Don’t get me wrong I love chocolate and other sweet goodness. Still I am increasingly aware that too much sugar is not a good thing. In fact the over consumption of sugar is linked to a host of health problems. Why not mix in some healthy Valentine treats? 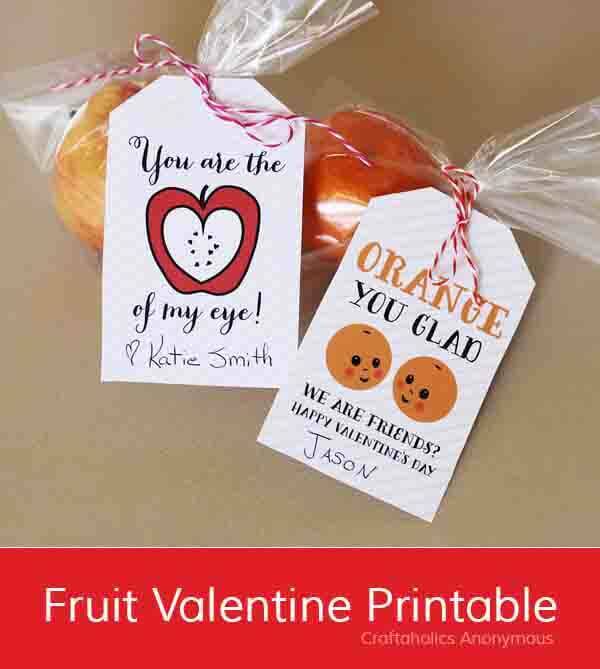 These free Valentine fruit tags will bring a smile to any child’s face. Are you enjoying this post? Is it helpful? Please share it on social media! In recent years attention there has been a drive to raise awareness that children are forced to work in some cocoa farms. You can get more information about this issue here. As consumers we can choose where we spend our money. Buying fairly traded chocolate is a powerful way to send a message to the chocolate makers. Child labor is not acceptable and we will not support it. 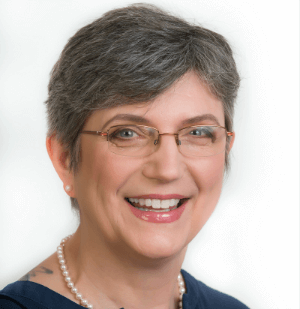 Celebrations such a Valentine’s Day can be hard for families going through hard times. Decorate a jar with hearts and use it to collect coins. Contact a local organization that reaches out to help families in your community and ask them what they need. These might include a women’s shelter, food bank, or refugee center. Go together as a family to buy and deliver the needed supplies. Put together kindness bags to hand out to people in need. February can be a cold month for people of the streets. Kindness bags are fun to assemble and give out. Take the bags to a homeless shelter if you don’t feel comfortable handing them out. I love these bright kindness clips from Happiness is Homemade. Challenge your kids find creative places to clip them and brighten someone’s day. Download and make these adorable bookmarks from Natural Beach Living. Take them down to the library and leave them in your favorite books as a surprise find for someone else. You may want to tell the library staff what you are doing first! Make up these smile it forward compliment cards from The Kid’s Activity Blog. Leave them in random places around your community for people to find. How creative can you be? 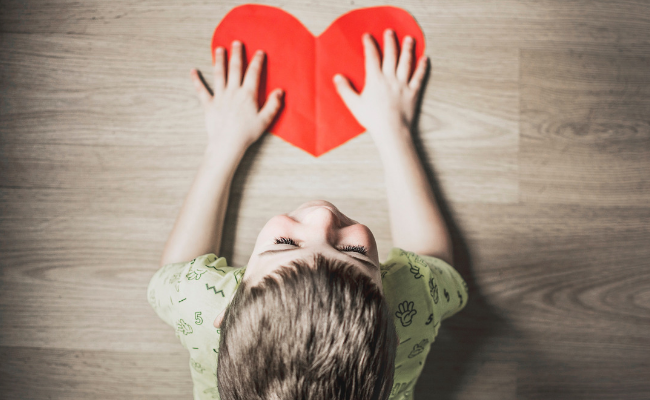 Call a family meeting to talk about ways your family can spread kindness around for Valentine’s Day. You might start by watching this video from Kids For Peace. 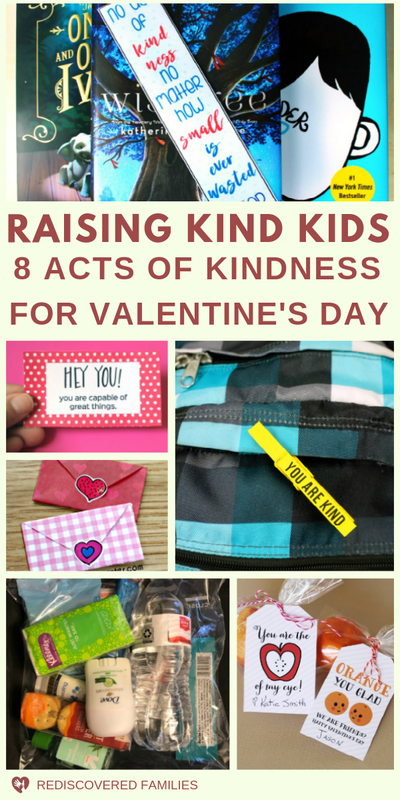 Explain that you want to do some acts of kindness for Valentine’s Day and brainstorm ideas. 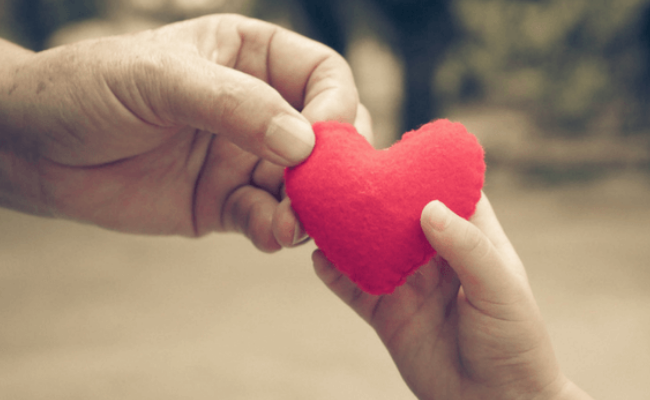 Ask: what could we do to show kindness this Valentines Day? Listen to your children’s ideas and write them down. 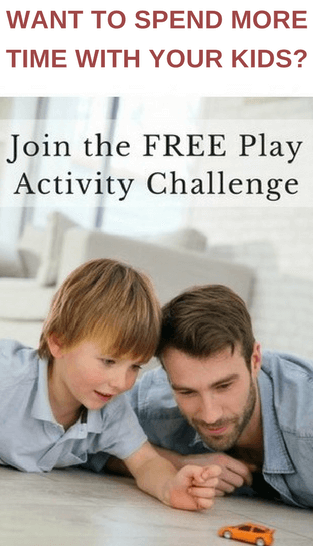 Read through the ideas in this post and invite your kids to choose their favorites. Look through your list and choose one or two ideas. Take a look at what you will need to do. Make lists and schedule time to gather supplies, make crafts, and go out to spread kindness. Be generous in your praise and encouragement as your kids practice kindness. Valentine’s day can be a wonderful time for families. It is a time to make memories and affirm your love for each other. Adding in some acts of kindness will turn this day into a time of giving and that is great way to celebrate love. Want to save this post for later? Just pin the image below. 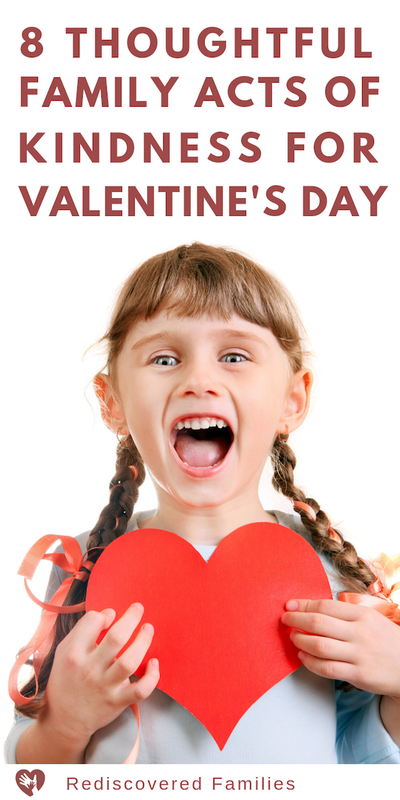 How will you celebrate February 14th with your children this year? 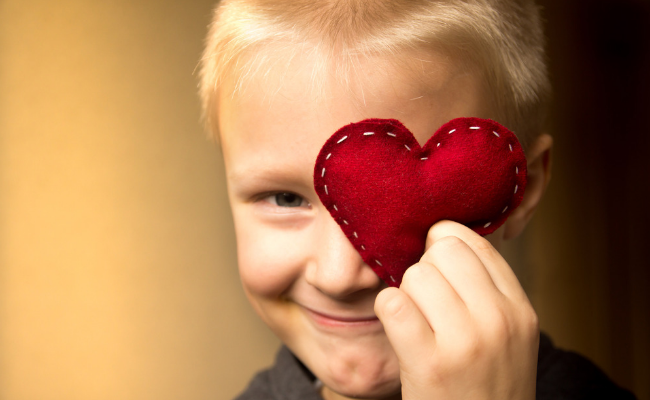 Have you found ways to incorporate some acts of kindness for Valentine’s Day into this celebration? Please share your ideas in the comments below. I absolutely love these ideas! I agree, it’s so over commercialised. I especially like the helping the new parents idea. These are great ideas Sharon! They do help keep things in perspective in our consumer driven society. Thanks for sharing! Thanks Kelvin. I have to confess that the consumer driven stuff leaves me cold on so many levels.I am encouraged by the slow movement away from it. Great and inexpensive ideas for Valentine’s Day. Anyone could really appreciate any suggestion from the list shared. Thank you.